Aamir Khan on Twitter !!!?? Tweeted recently by Karan Johar [@kjohar25] .. that [hold your breath..] Aamir is on Twitterverse !!!! Its @aamir_khan on Twitter. Who tweeted from 'Samsung' Mobile, of course, brand he is promoting. Interesting that " via Samsung Mobile" link leads us to Samsung's website !! I still have doubts if its the original account. A Film about Films. How can I not love such movies? And this is the tribute to none other than - Baap of Indian Cinema. Dada Saheb Phalke ! So, by default this one is a must watch for any lover of Indian Cinema. I wonder why this movie hasn't been marketed and released extensively besides having such potential. But then, on the other hand, the same fact is there. Its a regional movie, Marathi to be specific. So, naturally not many takers outside region of its origin. Though thanks to Oscars, all came to know about it cause it was selected as official entry in Best Foreign Language Film category. Moving on, Harishchandrachi Factory is [true] story of Dadasaheb Phalke [Nandu Madhav]. Who loves doing magic shows and plays for kids. Once he comes across world of cinema [silent cinema at that time] and amazed he is, decides to make his own! How he fulfills his dreams is a wonderful tale . His wife Sarswati [Vibhawari Deshpande] is a biggest support for him. So are the two kids too. With the help of them and a few friends, he learns movie making in England and starts making movie about Raja Harishchandra, calling their production 'Harishchandrachi Factory' [Harishchandra's factory]. As LAGAAN is celebrating its 9th Anniversary, here is my post for LAGAAN week, going on at blog-world of Bolly Bloggers. Initiated by theBollywoodFan. Warning: Do not read this post, if you [STILL] hasn't seen this movie, coz the post is total spoiler. I always get confused when I need to write something about great movies like this. [Can not find proper words to describe, and there the pictures come as help.So, the post is naturally picture heavy. ] If you have read book - The Spirit of LAGAAN, you must have known how tough the shoot of this climax was. [Chapter 10 : Ten Thousand Actors]. Aamir / Ashutosh could have gone for VFX, but No, this is Aamir's movie. So it has got to be perfect in every way. Must read the book how all this became possible with efforts of each and every crew members. Generally, I do not come out of my Bollywood shell and watch movies of different languages other than English. But nowadays, things are changing and I am getting nice suggestions for movies to see. On suggestion of Blogger-dost Bhargav Saikia, I watched this Spanish Horror movie called El Orfanato [The Orphanage]. Horror being my one of favorite genre, I obviously like most of them. But this one, I loved. Movie is about Laura [Belen Rueda] who grew up in an orphanage, returns to that place and plans to reopen it for disabled children. After few days, his son Simon claims that he met a boy named Tomas in a cave near sea shore. Things take complete U Turn when Simon goes missing during a kids party, and shocking revelations about the orphanage keeps coming up when Laura starts searching for his boy when police fails. Confused I am after watching this movie. It has everything, a good movie requires. 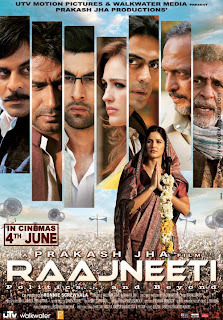 Perfect cast, acts, storyline and even the typical bollywood cliches [which I always love by the way]. But the way things are mixed up, made it torturous for me, only second half. 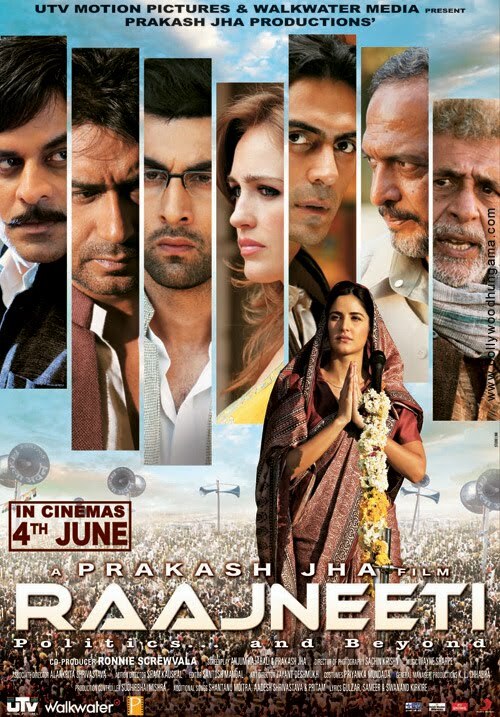 Director Prakash Jha's Raajneeti starts off really well. Such a gripping screenplay that leaves audience stuck on their seats with its constant on-goings on screen. Each character gets well defined introductions. Each of them acts brilliantly. I personally don't like the subject of politics, in real life and also in movies. But I got totally hooked as the movie further went on.